Remarkably, Candy Crush Saga is more successful than it’s ever been. In the ten years since the Apple App Store launched (followed slightly later by Google Play store), the mobile games industry has undergone a massive transformation. From effectively zero billion dollars of annual revenue in 2008, it’s now estimated to be the largest single sector in gaming, worth over $50 billion annually. There are many structural reasons underpinning this, notably the availability of smartphones and app stores globally, especially in populous regions such as south east Asia. But in terms of more direct reasons for the explosion in mobile games revenues, the cause is clear – the introduction and widespread adoption of the free-to-play business model. First available in 2009, it wasn’t until developers better understood how to build in-app purchases into their games and their games’ long term mechanics, and gamers better understood what they were getting for the money that the market really took off. In that regard, then although it’s been ten years since the App Store launched, it won’t be until February 2022 we can celebrate 10 years from the launch of GungHo Online’s Puzzle & Dragons, which was first mobile game to generate $1 billion. Closely followed by Supercell’s Clash of Clans and King’s Candy Crush Saga later that year, it’s striking all three games continue to be incredibly successful; still generating hundreds of millions of dollars annually. Indeed, because of their longevity, it’s estimated these remain amongst the most lucrative mobile games ever released, have generated well over $5 billion in lifetime revenues. Yet not all three are in rude health, notably Puzzle & Dragons, which has been in decline since it peaked, generating $1.5 billion in 2013. The shine has also come off Clash of Clans recently too, although it’s still estimated to be generating $500 million a year. Remarkably, however, Candy Crush Saga is more successful than it’s ever been. One reason for this state of affairs is over time, players get bored and more onto new games, and goodness knows there have been a lot of good mobile games released since 2012. Counter-balancing this, players who continue to play get more committed and the developers get better at monetizing them too. It’s this dynamic that ensures despite its decline, Puzzle & Dragons managed to generated around $600 million in 2017, six years post-launch. Its decline has been accelerated though because it was a hit mainly in Japan and that market is now saturated. Simply put everyone everyone who would be interested in Puzzle & Dragons has already played it. The game’s highly localized success becomes a long term ceiling. This isn’t the case for Clash of Clans or Candy Crush Saga. From Europe and North America to the Middle East, China, Japan, South Korea and south east Asia, these are globally successful games and that means there are always new players to advertise to and attract. This is especially the case for Candy Crush Saga which has more equal gender appeal than strategy games such as Clash of Clans, and is an easier experience to play. This analysis can be extended across the entire mobile game sector, as shown in the following graph. It plots a game’s release year (horizontally) against the level of its regional success (vertically), with lifetime revenue represented by the area of its icon, and shows some significant results. As expected, the longer the game has been released, the more revenue it’s likely to have generated (the larger the icon’s area). What’s not expected is many of the largest icons are located low down on the horizontal axis, meaning that like Puzzle & Dragons, they’ve only been successful in their local markets. Examples include Monster Strike and Fate/Grand Order in Japan, Lineage M and Lineage 2: Revolution in South Korea, and Honor of Kings and Fantasy Westward Journey in China. The reason is these games are highly tuned to local tastes. In the case of JRPGs such as Fate/Grand Order this could be specific gameplay, or as in the case of the Lineage games because they’re based on a culturally historic game brand. Yet, what’s interesting about these games is that over the years they’re not likely to scale and grow as fast as similar titles that appeal to global audience, especially if they only appeal to a relative small population. In this way, a game such as Pokemon Go is more likely to hit the heights of +$5 billion in lifetime revenues than Lineage M, despite the latter’s explosive launch in South Korea in June 2017. Of course, not all games can scale indefinitely. The likes of Summoners War, Marvel: Contest of Champions and Dragon Ball Z: Dokkan Battle are niche compared to say Candy Crush Saga, but that doesn’t mean they’re flops. In fact, each has generated over $1 billion. Similarly, despite only appealing in China, the massive addressable market means Honor of Kings and Fantasy Westward Journey shouldn’t experience a ‘Puzzle & Dragons-style’ revenue decline for years to come. 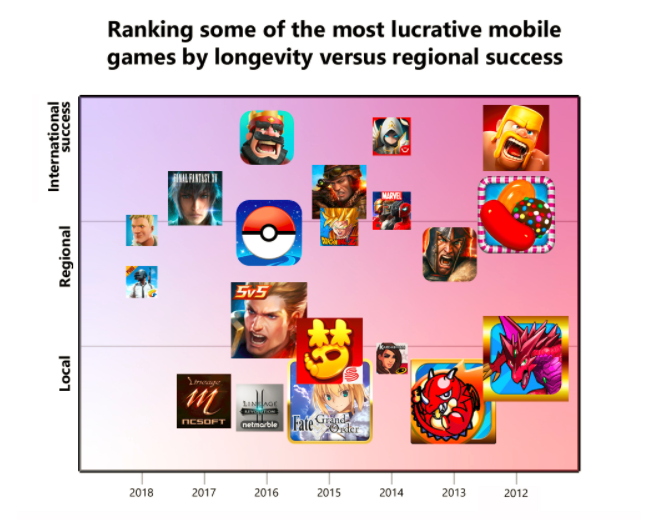 Yet considering this most rarified selection of mobile games – the billionaire club – certainly the best place to be is in the top right corner. 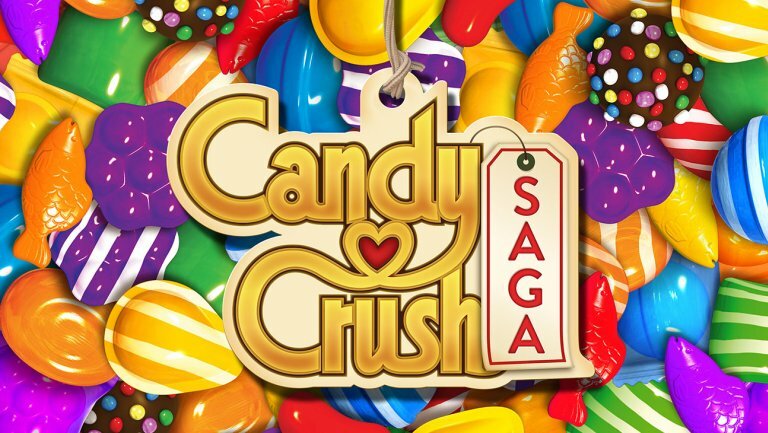 So who’d bet against Candy Crush Saga to be the first mobile game to hit $10 billion of lifetime revenue?